It’s frustrating to pay ATM fees when all you want to do is get your own money. Not only do you pay fees to the ATM operator, but your bank may add charges as well. Those costs add up throughout the year, and that means you have less to spend on things that matter. So, how do you find free ATMs that help you keep more in your bank account? The simplest (but sometimes least convenient) solution is to visit your bank when you need to withdraw cash. Your bank’s ATM should be free for you to use, although customers from other banks will most likely have to pay fees. Whenever possible, plan ahead and withdraw cash that you’ll need for upcoming events while you’re at your bank. You’ll save money, and you’ll save a trip: There’s no need to get cash elsewhere in a few days and pay foreign ATM fees. Unfortunately, your bank might not have ATMs located where you need them, but there are other ways to pull money out of ATMs for free. If you can’t use your bank’s ATM, find out if your bank offers ATM fee rebates. Some banks refund any charges that ATM owners add to your withdrawal. Fee reimbursements are a standard feature on popular cash management accounts, and some local banks and credit unions also offer rebates. 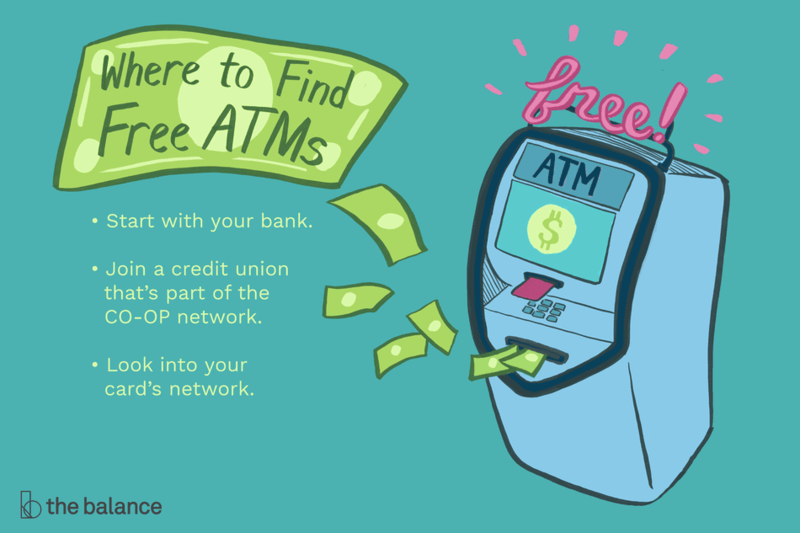 If you belong to a credit union that's part of the CO-OP network, you have access to almost 30,000 free ATMs nationwide. Many of these ATMs are located at credit union branches, but you can also find them at retail outlets like Costco and 7-Eleven. In addition to using free ATMs, credit unions often allow you to walk into a branch and work with a teller through “​shared branching.” If your credit union is one of them (and you can find an office of another shared branching member), take advantage of that service. To learn more, visit co-opcreditunions.org. There, you can search for ATMs nearby, as well as get free ATM locator apps. Most debit cards are part of an ATM network that allows you to make free withdrawals. Whether you bank with a megabank or a small credit union, institutions typically team up with card networks, so using an ATM for free is just a matter of finding ATMs in the right network. To find out which network your bank uses, just ask. Your bank’s app or website should also point you in the right direction if you use an “ATM Locator” or similar tool. If your bank is no help, take a look at your debit or ATM card: On the back of the card, you should see logos for various card networks (or you might not, depending on your card). Those logos tell you how to search for free ATMs in your area. Several networks are listed below. If one of the names matches the logo on your card, head to their website for more details and to use their ATM search tool. Many of these sites also offer apps that can direct you to the nearest free ATM using GPS. Note that some networks also list stores that allow you to get cash back on purchases (you can always make a small purchase if there’s something you need or if it’ll cost less than a nearby ATM). Not free? As you use ATM locators, keep in mind that some of them may show ATMs will cost you money. In some cases, the ATM is free (it won’t charge a surcharge), but your bank will charge you for using that “foreign” ATM. To avoid foreign ATM charges, look for banks that allow you to withdraw anywhere, fee-free (some online bank accounts, including Capital One 360, don’t charge foreign ATM fees). If you can’t find a free ATM nearby, there may be other ways to avoid charges, including going completely cashless. Cash back: You might be able to get cash back from a store when you make a purchase with your debit card and use your PIN. Just be sure not to spend money on things you don’t need. With a little bit of planning, you can stock up on cash you’ll need for the next few days while you stock up on food at the grocery store. Pay with plastic: You have your debit card handy, so why not use it instead of paying with cash? If you’re with a group, you can even pay for others’ expenses and have them repay you in cash (which saves you a trip to the ATM). Alternatively, friends can pay you with free P2P payment services. Keep in mind that swiping your card all around town may be riskier than using your card at ATMs—every time you use your card you expose your card information. However, you generally have some protection as a consumer, and bank ATMs can also be compromised. Using a credit card would be safer—just be sure to pay it off every month.